Online slots with a Summer theme including Honey to the Bee Slot, Paradise Dreams Slot from RTG, Lifes a Beach Slot, Beach Babes and Flower Power Slot from Microgaming. 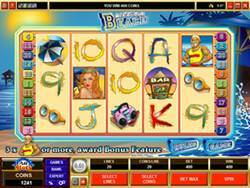 Beach Babes is a Microgaming video slot with a beach theme that is filled with icons such as Bikini Clad Babes, a Hunky Lifeguard, Beach Balls, Palm Trees and the high value symbols of playing cards. 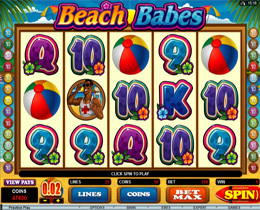 Beach Babes includes features such as a Wild, Scatter, Multiplier and a Free Spins Bonus. The Beach Babes icon is the Wild which substitutes all others except for the Scatter and helps form winning combinations. The Free Spins round will be activated and you will be rewarded with 20, 25 or 30 Free Spins when you have 3, 4 or 5 Ice Box icons show up anywhere on the reels including a 6x Multiplier. This game is ideal for both penny slot players and high rollers. 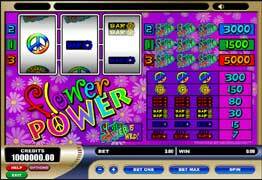 Flower Power is a standard slot game with a "bohemian" theme which was quite in fashion in the 60’s. The background of this groovy slot seem to be from the set of an Austin Powers movie and icons that appear here typical of the 60’s era, such as VW Camper Vans, Record Players, Peace Signs, Bubble Televisions and far out 60’s Fashion Logos. 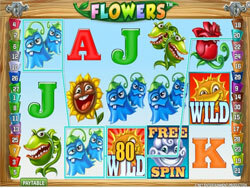 Various flower icons make up the winning combinations, along with typical BAR slots icons that also have flowers on them. With spring almost in the air it’s time for a blossoming start by playing Flowers slot, which is the latest slot release. The colourful graphics bring the superb animations to life in this slot including lucrative features such as Wilds, Free Spins and Double icons. The double icons count as two separate icons in one which leads to very appealing pay outs. There are up to 30 Free Spins which re-trigger and have a 10x Multiplier on offer. Stacked Wilds will show up on the reels with great potential for amazing wins. A Summer slot with a free games feature. Your winnings will be doubled if a worker bee completes a winning combination. If a worker bee lands on the 1st reel and a bee hive on the last reel both at the same time, then 15 free spins will be activated at 2x winnings. 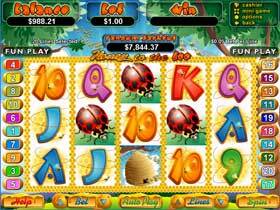 Honey To The Bee Free Slot also gives you the opportunity to crack the Random Progressive Jackpot. A 5 reel and 20 payline summer slot from RTG. 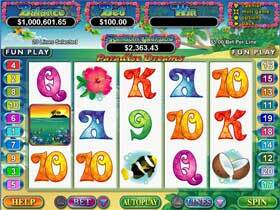 Be taken to a Paradise Island in the tropics where you can play this feature packed slot great payouts. The Girl is the Wild symbol, she replaces all other symbols except the Scatters, in order to complete winning combinations. She also doubles the payout. If you get 3 or more Scatter symbols - the Paradise Island - you will win either access to the Paradise Pick Bonus Feature, or 10 Free Games. In the Free Games feature you will find a Floating Butterfly symbol which multiplies the triggering bet by between 2 and 1000 times! In the Bonus Feature you pick 5 out of 12 flowers, to win between 2 and 1000 times the triggering bet as well. A slot machine dedicated to all those beach lovers out there. Life's a Beach is a 20 line, 5 reel Microgaming slot with a bonus feature. The bonus feature is triggered when 3 hunky lifeguards land anywhere on the reels, and you then get to choose from the umbrellas for hidden cash rewards. 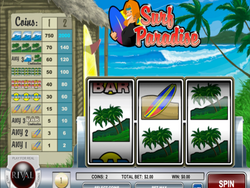 Surf Paradise is a standard classic slot from Rival Gaming with a wonderful “Water Surfing” theme that includes very suitable icons such as a surf board, coconut trees on the beach and the blue sea. The game has a great atmosphere with excellent sound effects of the ocean and a bird's song that plays in the background that makes you feel as though you are really on the beach. 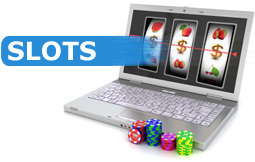 Players can enjoy a huge jackpot of $10,000 in this game. But in order to stand a chance of winning the jackpot players have to bet the maximum coin denomination.